I suppose there is no ‘typical’ RYA course week… Every week is very different. Different students, different abilities, different weather, different dynamics onboard – all of these different courses that us instructors get to experience are why we keep coming back for more!! It’s 3pm on a Sunday afternoon and all 4 of my students have now arrived – perfect timing as we’ll be able to get off sailing at this rate. I’ve got a mix of RYA Competent Crew & RYA Day Skipper – a great combination as the crew get a lot of experience helping the new skippers out. Initially I meet you all in the cafe, introduce myself and yourselves to each other, present you with your log books and paperwork, have a general chat on how the course will run and try to gauge your experience and expectations. We then head over to the yacht and have a quick chat about domestics, allocate cabins and make ourselves at home onboard. We use all sorts of different boats for our RYA training, but only those that are RYA coded – these are yachts that have been inspected by the RYA and are deemed appropriate for RYA training. We then get the boat ready for sea, don’t worry if you don’t know everything straight away or you don’t remember everything, we will have plenty of practice at these basics! Then a quick lesson on leaving the quay and how to weigh anchor, including proper use of the windlass. 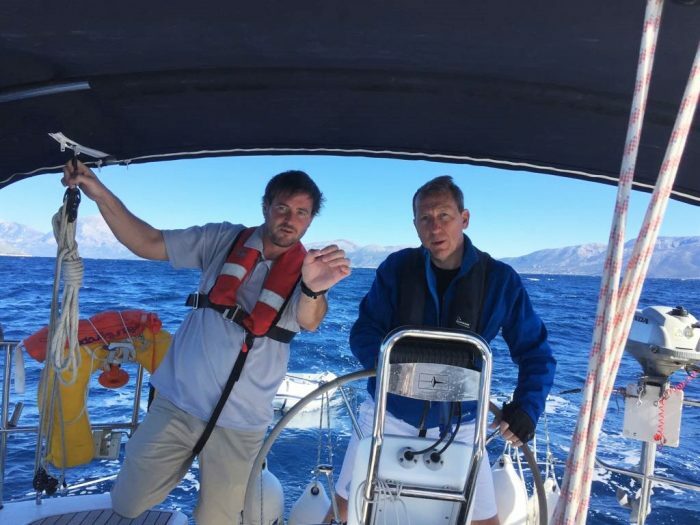 Once out of Vliho we get the sails up and get sailing – it’s great to do this as early as possible in the course because it gets the whole crew working together straight away which is really important with a group of 4 strangers! If possible I throw a fender in and do a MOB practice – just in case I fall in! Then as we approach the harbour we talk about setting up the yacht for arrival at your first overnight destination. Once we arrive, I let the students moor up with my guidance at the helm. It’s a good confidence booster early in the course. Once safely in, we put the yacht to bed by going through our evening checklist. Time for a quick debrief on the afternoon’s events then we head to the taverna for a chilled out dinner. We start the day by going through our morning checklist and getting the boat ready for sea. I then teach a session on passage planning, you’d have learned about this in your Day Skipper theory course but it’s important to know how to put it into practice! I then normally let a student draw up a plan and execute it to a nearby harbour or bay, once we arrive I debrief the skipper and start a new session on power handling. I try and start in easy open conditions to promote confidence in the students. Once all the students have had a few goes and we have had a spot of lunch, I get the next skipper to draw up a plan for our next destination… at this stage I am starting to take a step back and let my students start to draw up plans and skipper the boat. They won’t learn if I am involved too much. On route, we get the sails out, carrying out sailing drills and more MOB practice to reinforce yesterday’s introduction. Once in harbour and the boat is put to bed, I give individual one on one feedback to each student from the day’s events and give them an idea of the areas which need most attention. I then get the next student to draw up a passage plan to a bay for the next day, so we can get away nice and early. Again, don’t panic when I go through with you the areas we need to improve on – you aren’t expected to know everything without my training. Off we all go ashore for dinner! The whole crew are in the routine now… we wake up fairly early and get the boat ready for sea, usually followed by a quiz on the initial safety briefing I gave on Sunday. One of the skippers will carry out the passage plan, then we leave harbour and head to a bay for lunch. We undertake some sailing drills on route and once anchored up carry out a reefing session on anchor as the boat sits into wind and everyone can watch without thinking about where the boat is heading. After lunch we head out again and practice sailing triangular courses which means working on all different points of sail and perfecting our sail trim. Once at our next harbor and the boat is put to bed, we head to a taverna ashore where (over a beer) I normally teach weather, buoyage and tidal sessions. Here we go again! The crew gets the boat ready after a breakfast on board, and usually we stay fairly local in harbour for a big power handling session including mooring buoys, stern-to, side-to. All of the crew have a go, and another go (and also many goes as they need) before I start making things a little more challenging by introducing different scenarios…strong crosswinds, close quarter manoeuvering. Then we head out and do lots of sailing games, sailing back to fenders with no engines etc. These are fun ways to learn that also incorporate an awful lot of what I have taught these students in the past couple of days. I normally get in reasonably early around mid-afternoon to do a big debriefing session with signing off log books etc, to really see where we are all at. We talk through emergency and problematic situations such as engine failure, helicopter rescue, prop wraps and steering failure. The students will then have a couple of hours to create detailed passage plan and prepare the boat for our 4-hour night sail. The night sail kicks off as soon as it is dark. Night sailing is something that some of the novice students have not done before so there’s always a mixture of nerves and excitement. Some evenings when we have a full moon, it is amazing out there. We get into harbour in the early hours of the morning, put the boat to bed and head to bed ourselves. A slower start this morning as the crew are a little tired from the night sail last night. With only a short time left of the course, this is where the course really gets tailored to what my students need at this stage, I have a good idea by now and some up with exercises to test the areas that anyone is weak on. I step back now, allowing the crew to take more control of the yacht and the daily decisions. I might throw the odd MOB in when they’re not looking, just to keep everyone on their toes! The last day of the course and the crew should have full control of the yacht now, I normally stay on shore while you do power handling sessions to give you the confidence that you can do it without me there!! Yes it does make me slightly nervous but I certainly wouldn’t do it if my students weren’t ready and if I’ve done my job properly, they will be ready! Then it’s a case of going over whatever the crew need the most to finish off the course. We head in to Sivota on the Friday afternoon, put the boat to bed and have our final debrief in Yannis Taverna. The other RYA course boats and instructors will be here too so we have a small prizegiving ceremony to present you with your certificates, then you’re on your own as a crew! I go home, and you guys get the boat for an extra day on your own to practice and gain confidence in your own ability. It’s a fantastic way to get a taste of what a bareboat charter is really like – ready for next time. 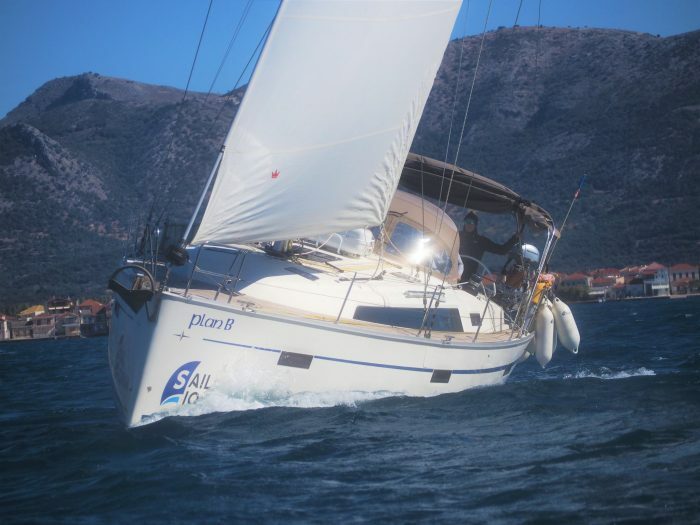 And if you’d like to read about what your first bareboat charter is like with Sail Ionian, then check out my blog post on Why The Ionian which includes information on our complimentary route planning service, stern-to mooring clinic and all the other assistance that we know first timers may need! 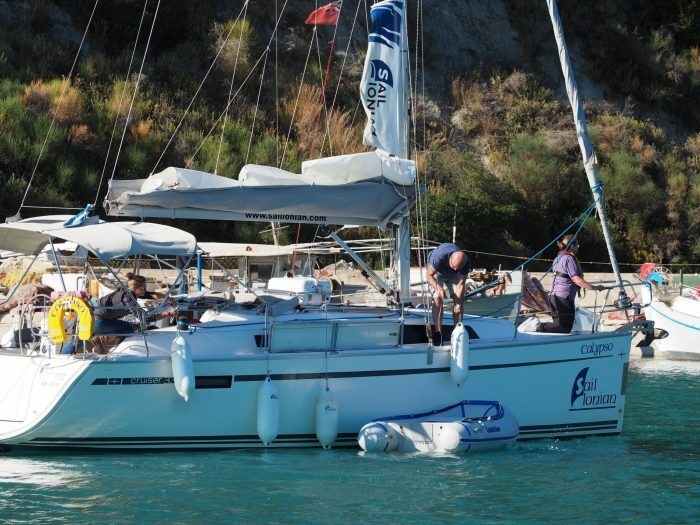 We run RYA courses pretty much every week of the season April-October, what better place to learn than in the Ionian? !